The Centers for Disease Control defines Domestic Violence (DV) or Intimate Partner Violence (IPV) as a serious, preventable public health problem that affects millions of Americans. The term “intimate partner violence” describes physical violence, sexual violence, stalking, and psychological aggression (including coercive acts) by a current or former intimate partner. Physical violence is the intentional use of physical force with the potential for causing death, disability, injury, or harm. Physical violence includes, but is not limited to, scratching; pushing; shoving; throwing; grabbing; biting; strangulation or neck grabbing; shaking; aggressive hair pulling; slapping; punching; hitting; burning; use of a weapon; and use of restraints or one’s body, size, or strength against another person. Physical violence also includes coercing other people to commit any of the above acts. Stalking is a pattern of repeated, unwanted attention and contact that produces fear or concern for one’s own safety or the safety of someone else (e.g., family member or friend). Some examples include repeated, unwanted phone calls, emails, or texts; leaving cards, letters, flowers, or other items when the victim does not want them; watching or following from a distance; spying; approaching or showing up in places when the victim does not want to see them; sneaking into the victim’s home or car; damaging the victim’s personal property; harming or threatening the victim’s pet; and making threats to physically harm the victim. Sexual violence is divided into five categories. Any of these acts constitute sexual violence, whether attempted or completed. Additionally, all of these acts occur without the victim’s freely given consent, including cases in which the victim is unable to consent due to being too intoxicated (e.g., incapacitation, lack of consciousness, or lack of awareness) through their voluntary or involuntary use of alcohol or drugs. For more information about sexual violence in an intimate partner relationship, please visit the CDC website. Psychological aggression is the use of verbal and non-verbal communication with the intent to harm another person mentally or emotionally and/or to exert control over another person. Psychological aggression can include expressive aggression (e.g., name-calling, humiliating); coercive control (e.g., limiting access to transportation, money, friends, and family; excessive monitoring of whereabouts); threats of physical or sexual violence; control of reproductive or sexual health (e.g., refusal to use birth control; coerced pregnancy termination); exploitation of victim’s vulnerability (e.g., immigration status, disability); exploitation of perpetrator’s vulnerability; and presenting false information to the victim with the intent of making them doubt their own memory or perception (e.g., mind games). The National Domestic Violence Hotline recommends watching out for these red flags. Control what you do, what you wear, who you see or talk to or where you go? Equate jealousy with “love” by accusing you of flirting or cheating on them? Pressure or force you to engage in sexual acts against your will? Check your call log, text message history, or emails? Engage in intimidating behaviors such as punching walls, driving dangerously, or other threatening ways? Call you multiple times in a row or send threatening text messages? Shove you, slap you, choke/strangle your neck, or hit you? you may be in an abusive relationship. Get help. 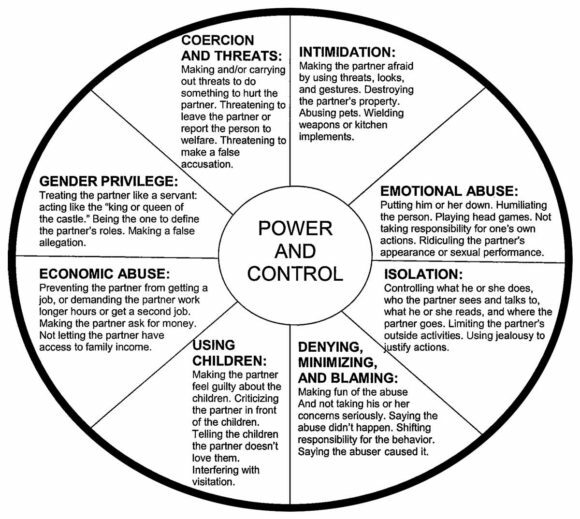 For a detailed, visual diagram of what domestic violence/intimate partner violence can look like, please refer to The Power and Control Wheel as developed by the Domestic Abuse Intervention Project and adapted for gender inclusivity by SAVE: Stop Abusive and Violent Environments. 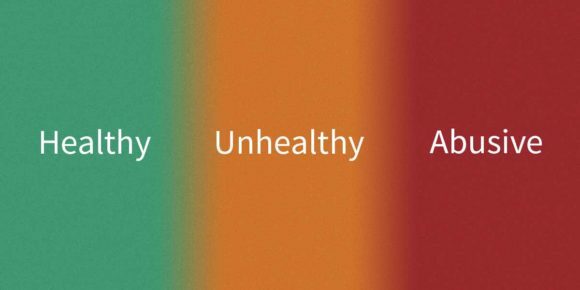 See where your relationship may fall on The National Domestic Violence Hotline’s “Relationship Spectrum,” ranging on a scale of Healthy, Unhealthy, and/or Abusive. Notice the signs of an unhealthy relationship before it evolves into an abusive relationship. If you find that you are in an unsafe or abusive relationship and need support or guidance, talk to a victim advocate now. Get help.